If It Ain’t Broke Don’t Fix It!! Hi all! Recipes are created in any number of ways. Some come from places unknown in a cook’s brain, some are adapted with a personalization or two and some recipes we copy because they are just plain great as they are. 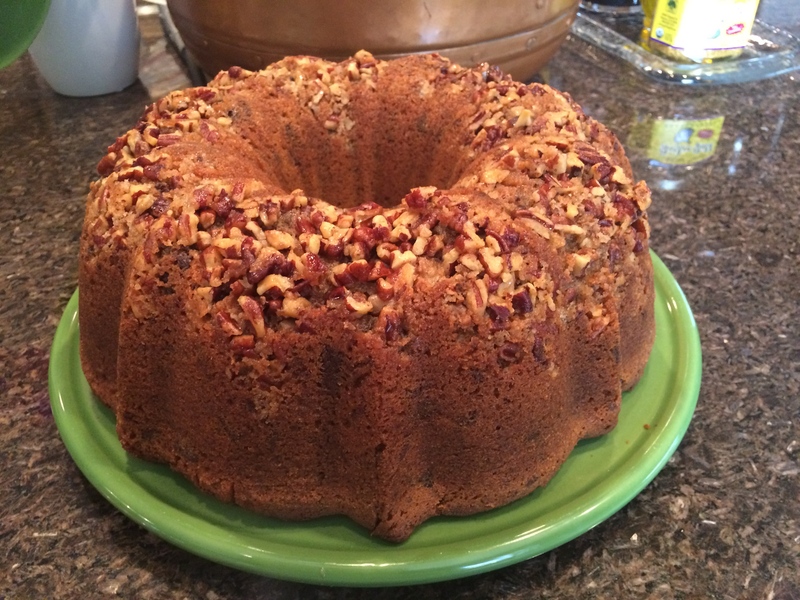 That is how I feel about the Brown Sugar Chocolate Bundt Cake, I made from the December 2014 Southern Living magazine. But wait it gets even more conventional. The recipe was actually an advertisement for Kraft products. In this particular recipe they were spotlighting Baker’s Semi-Sweet Chocolate. It is rare that I don’t find a recipe and then change it up somehow. Seriously, it could be something as simple as adding more or less of an ingredient or changing the serving suggestion. Sometimes I start with somebody else’s recipe and by the time I’ve changed this or that, to make it my own, it is a completely different recipe. With this cake, I changed nothing. I thought it was that good. When I make a recipe I try to imagine all the ways I can use it. This cake can be used traditionally as a dessert or as a coffee cake. The great thing is it bakes up quickly. As long as you keep these basic ingredients on hand, you can have a fresh baked cake with only about 30 minutes of preparation and an hour of cooking. You can serve this cake as is or you can jazz it up by drizzling a little chocolate syrup over it, or serve with fresh whipped cream (see post from January 16, 2015). I hope you enjoy this cake! Stir together pecans, butter and sugar for topping. Using a fork sprinkle in a large greased and floured Bundt pan. In an electric mixer, beat butter, brown sugar granulated sugar, and vanilla, at medium speed, until fluffy. Add flour mixture, alternating with buttermilk. Try to start and finish with the flour mixture. Beat at low speed until just blended. Scrape down as needed. Fold in chocolate and spoon into prepared pan. Bake at 350 for 50-55 minutes until a pick comes out clean.